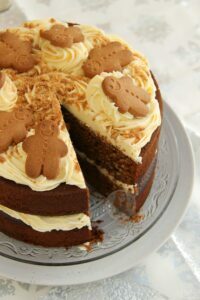 A Two-Layer Gingerbread Cake with Ginger Buttercream Frosting.. the perfect Christmas cake for the Festive Season! So this is Christmas in a nutshell. 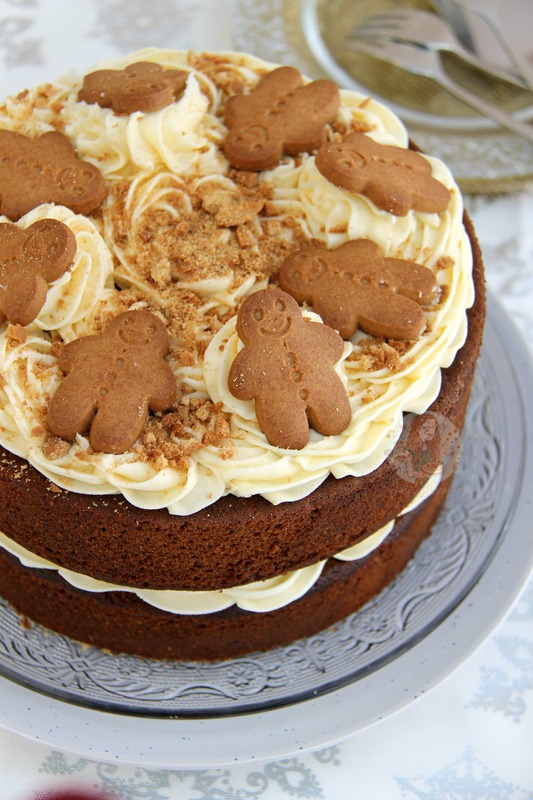 Well, its not really, its just a delicious cake but it is Gingerbread themed soooo its Christmassy! But anyway. 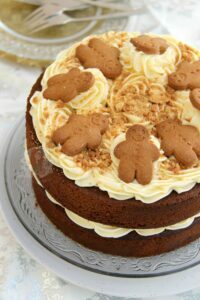 I posted my Gingerbread Cake back in March 2015 for the UK Mother’s Day, but its a loaf cake, and I wanted to post a delicious layer cake version for this Christmas season! I will admit that I did buy the little Gingerbread Men that I decorated the cake with from Tesco as I want to show that it works, and I honestly did not have time to make any myself. HOWEVER, you can use this delicious Gingerbread Men recipe buy use a really small cookie cutter and you’ll be there! This cake is a delicious deep and treacley ginger cake that has allllll the festive feels. I adore the flavour that the Syrup, Sugar and Treacle create, and then when mixed with the ground Ginger it is WONDERFUL. However, something that even beats the taste of the cake, is the DELICIOUS and SO very Christmassy smell that occurs when baking this treat. OH. MY. DAYS. I genuinely cannot describe how wonderful my house smelt when this was baking and cooling, it was amazing. 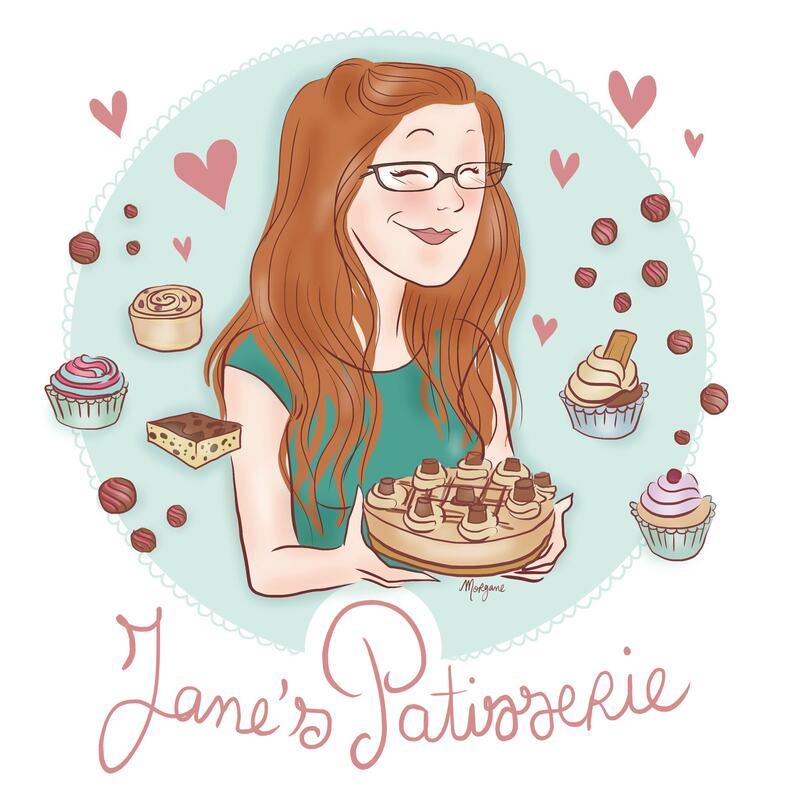 Like so amazing, even the postman asked what it was and slightly insulted me for baking something Christmassy so early (I made this a month ago compared to when this post has gone live!). I went for a simple Ginger flavoured Buttercream Frosting for this one as I adore the flavour. I used a touch of Vanilla in the frosting as well because I like my frosting to be sweet, but you don’t have to use it if you don’t want to do so! 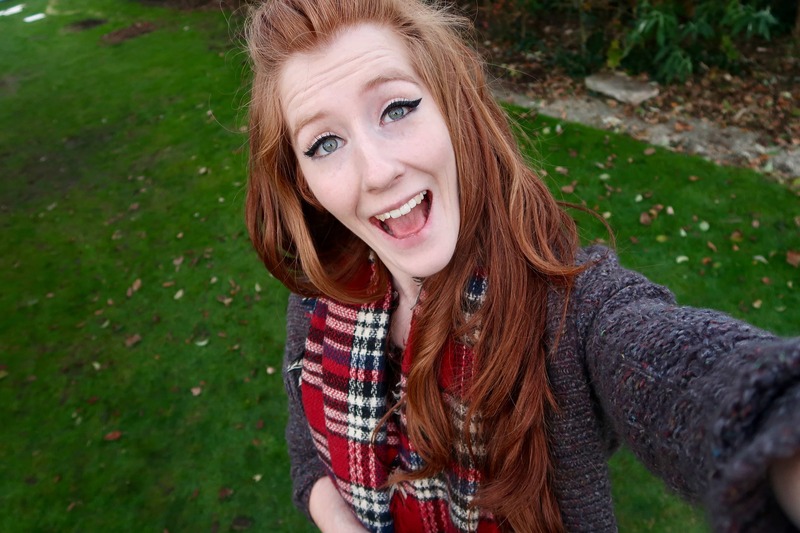 But anyway, I love it. I use a simple supermarket brand Ground Ginger, but I nearly aalllllwaaaayyyysss use Nielsen Massey Vanilla because it is simply glorious! I find the flavour so much stronger than any supermarket brand, and I just think its so much more worth the money. It may seem much more expensive, but the size of the bottle should should it’ll last SO much longer! When I made this cake the first time, it was pretty damn deep, so I reduce the recipe slightly. I originally started off with 300g of everything, and it was still just as delicious, but maybe a tad too much? I reduced it slightly back to the original BBC Food recipe I based this on, but it wasn’t quite enough. The middle heaven was 250g! Perfect amount. I did however bake this at 150C Fan in my oven, and I found it so much nicer. It baked flatter, and almost seemed more moist! It was so yummy. I will be making this treat again closer to Christmas to celebrate, and I think you should all too! Enjoy! 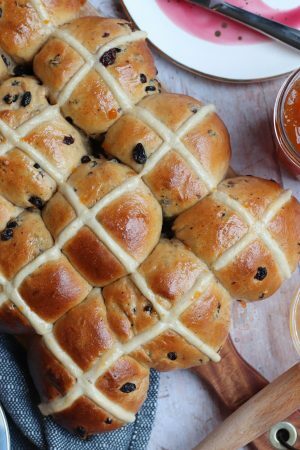 Add the Butter, Light Brown Sugar, Golden Syrup, and Black Treacle to a large pan and heat gently and stir frequently until the mixture has melted and is smooth. Leave to cool slightly! Sift the Self-Raising Flour into a LARGE bowl, and add the Ground Ginger. Whisk briefly so the ginger is distributed! Pour in the melted Sugar/Butter/Syrup mixture and beat together till smooth. Add in the Eggs, and Milk and beat again till smooth. It’ll be reasonably runny, and will nearly fill a large bowl, so be careful! Split the mixture between the two tins, and bake in the oven for 45-50 minutes until baked through. A cake skewer should come out clean, and when you listen to the cake it will not be making a ‘bubbling/crackling’ sound. Sometimes, a cake skewer can come out clean, but if the cake is still make the noise, its not quite done! Once the cake is baked, leave the cakes in the tin for 10 minutes, and then cool on a wire rack fully. To make the frosting, beat your butter in a stand mixer, with the paddle attachment for about 5 minutes so its really supple and soft. Add in the Icing Sugar 1/2 at a time, and beat fully in-between each addition. Add the Ginger, and vanilla and a little Whole Milk or boiling water to loosen if its a little stiff. You will only need 1 or 2 tablespoons to loosen so don’t go crazy! To decorate the cake, pipe half of the buttercream onto the bottom cake, and then add the second cake on top. 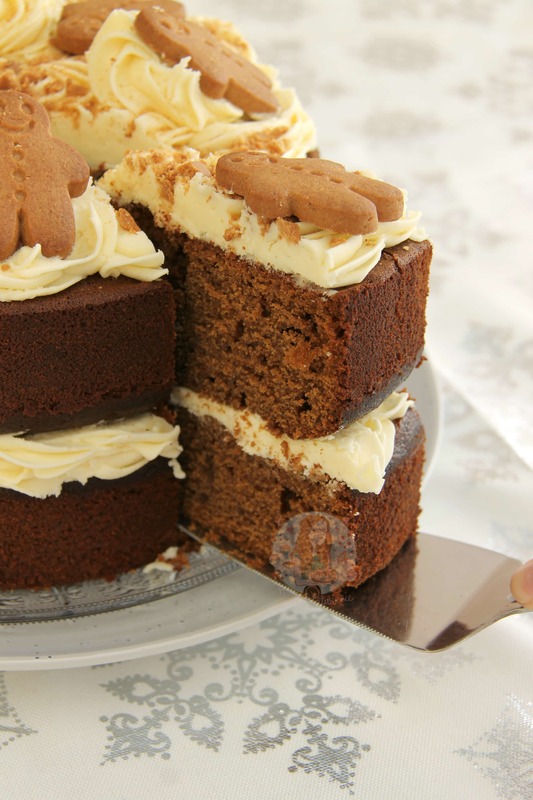 Pipe the rest of the buttercream on, and then add some Mini Gingerbread Men! 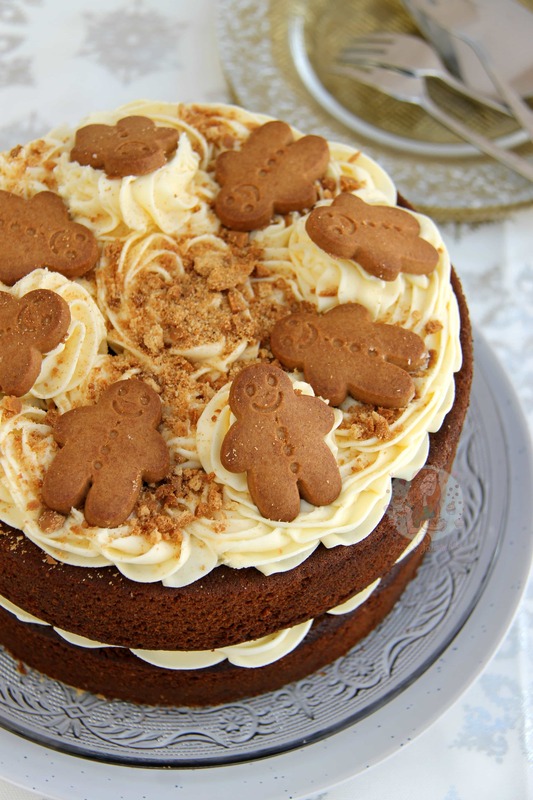 Add some crushed gingerbread men sprinkles, or some Christmas sprinkles and enjoy! This does make a large cake - if you want less, you can easily halve it, or bake into three tins instead of two. 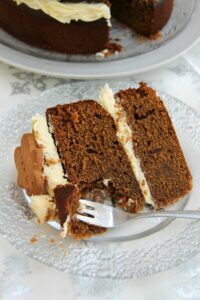 This delicious recipe is based on the BBC Food Ginger Bread Cake recipe with a few alterations to suit my post! It’s completely normal for the top of the cake to look slightly darker, and if anything almost burnt. It’s not actually burnt at all, its the treacle and the sugars in the sponge coming through, so don’t fear! This is a slightly denser cake compared to a victoria sponge, so be prepared. It is delicious though, and I think it needs the buttercream to lighten it! You can make it into a traybake instead if you prefer, but I would suggest a 10″ square tin thats deep as there is a lot of mixture. This cake will last 3 days once made! Find my other Cake & Christmas Recipes on my Recipes Page! Older Next post: No-Bake Black Forest Cheesecake! Newer Previous post: Gingerbread Fudge! Hi Jane. I really want to make this cake for Christmas as I have my daughter, husband and my two grandchildren coming! Is it possible to freeze the cake prior to decorating for a couple of weeks? Could these be adapted to make cupcakes? This cake is absolutely heavenly!!! It is very moreish! I can see their has been questions about making this recipe into cupcakes and I was wondering the same thing? That would be fantastic as at least I wouldn’t feel as guilty if I just had one every now and again! When I made the cake originally I made it into a four tier and it was just lovely. Thank you so much for all your lovely recipes! Hi! I love your recipes – they always turn out fab! Just wondering if I should do anything different if I make cupcakes with this recipe? Change the temp or timing? Thank you! 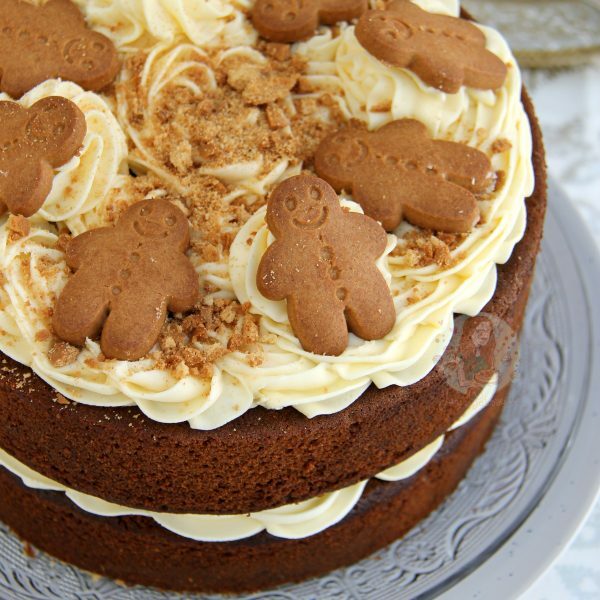 Hi Jane, your gingerbread cake looks great! I don’t have 2 8 inch tins so could I use 2 9 inch? Would this affect the cooking time and is the cake dense enough to stack or carve? 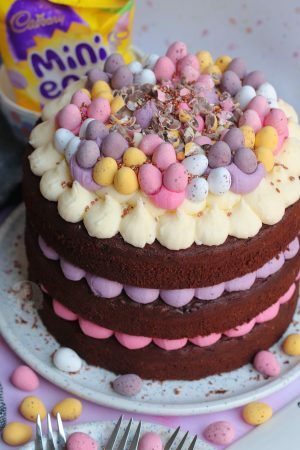 Could this recipe be used to make cupcakes instead of one large cake? Oh my days this looks delicious! Moving in with my other half in a couple of months so I may have to make this for my first Christmas in my own house =D I’ll probably add a smidgen of cinnamon too – ginger and cinnamon is one of my favourite flavour pairings for baked goods. Yummy! 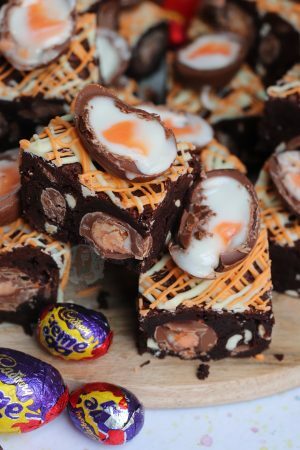 I’ve just been flicking through the recipe list and I think you’re going to be a very bad influence on me =P I’ll be adding lots of them to my collection so thank you in advance! I’ve only ever baked it in the tins specified so I can’t help you with timings etc but the same temp would be fine ? Don’t hesitate to leave me a comment if you enjoy one of my recipes ( in english of course ! ^^ ) ! It’s really really kind !!!!! !